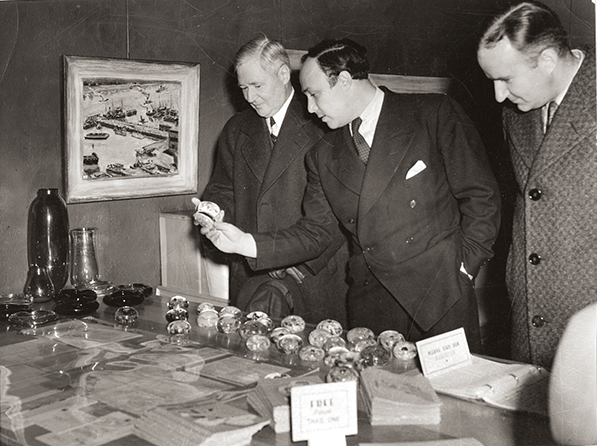 Michael Lenson, at center, examines locally made paperweights in the WPA Project in December 1940. The Star-Ledger. Michael Lenson, Henry Gasser, and Adolf Konrad recorded their impressions of Newark in the first half of the 20th century as the city was passing from old age into decay—just before the New Newark movement of the 1960s and the revival spirit of the Renaissance 1990s. While there are countless photographs in the Newark News photographic collection at the Newark Public Library and in other important resources such as the Newark Museum and the New Jersey Historical Society, the priceless impressions of these three individual artists show us their unique interpretive gift of portraying Newark. The backgrounds of the Big Three varied from commercial artist, easel artist, teacher, administrator and government official. They looked at the beautiful and the ugly, they recorded decline and progress, they marveled at an American city in its old age, and they recorded forever a community abandoned by the passing of a nation from an industrial to a service economy. All three documented the state of the city in transition to a healthy future in the second half of the 20th century. Their views were registered in realistic, cubist and surrealist works as found in murals of its public buildings, in the holdings of local and national museums, and in the pages of our history and art books. Any American city would be pleased to have such a record. Michael Lenson, 1905-1971, was born in Galich, Russia. He came to America with his sister and seven brothers and became an American citizen in 1919. During the Depression, he was aided by his family to some extent, and was fortunate to study with Louis Guglialmi and Gregorio Prestopino. In 1928 his career received a tremendous boost when he received the $10,000 Chaloner Prize for painting, which allowed him to return to Europe. There he studied and traveled for the next four years, spending part of his time at the Slade School in London and the Academie des Beaux-Arts in Paris. The remainder of his European education was spent studying in Italy, Spain and the Netherlands, where he came in contact with much of the great art of the West. Before leaving Europe, Lenson had a one-man show at the Doupil Gallery in London and exhibited at the Printemps and Autumn salons in Paris. On his return home, he became associated with the Works Progress Administration, moved to New Jersey and eventually secured a place in the organization as a spokesman and administrator. After returning home his first assignment was to paint a 16-by-75-foot mural at the Essex County Mountain Sanitorium in Verona. So good was his work, and so good was he as a spokesman for the WPA, that he was appointed assistant state supervisor in charge of the agency’s Mural and Easel Division, a post he held for the next seven years. In 1939, Lenson was commissioned to prepare a large and elaborate mural at Weequahic High School, called 'The History of the Enlightenment of Man.' It consisted of a series of six panels and was to be one of the largest such projects in the state. Before starting the project, he invited all Weequahic residents to discuss it. According to the artist, it 'proved a source of deep interest to both students and teachers alike.' The first panel depicted the pre-history of man and emphasized the fear of nature; the sabre-tooth tiger, lightning, eruption of volcanoes, and the primitive cave—emergencies existing before the Enlightenment. The second panel described the civilizing elements of Egyptian society, with its architecture, religion and sculpture. It was followed by the Greeks and their art, philosophy and sense of government. Rome and Sparta were included, and the addition of a medieval monastery rounded out the portrait with a hooded monk surrounded by books. The third panel was dedicated to great figures of the Renaissance: Michelangelo, da Vinci, Dante and Erasmus. The fourth unit shows an austere black-robed man seated in the middle of a series of volumes representing the 19th century. The next group of individuals are African-Americans working with the cotton gin. The west wall panel is devoted to medicine, doctors, nurses, patients and medical apparatus. Large figures of a boy and girl represent American youth, and the girl holds a jewel symbolizing the natural wealth of the nation. Another panel portrays workers at a mine disaster, and in the background are a series of skyscrapers. A bridge, dam and farm are used to illustrate modern man’s power over nature. The final panel represents 'security under the Enlightenment.' In the corner a broken cannon wheel symbolizes the peace which results from the whole movement. Lenson’s other best-known public mural is found in the Municipal Council Chamber in City Hall. It is titled 'The History of Newark,' and was completed in 1941. From 1944 until 1946 after the WPA folded, he was appointed director of the Newark School of Fine and Industrial Art. Subequently, he taught at Rutgers-Newark, the Montclair Museum and Fairleigh Dickinson University. While the artist continued to paint throughout his life in various traditional ways, he was also interested in cubism and surrealism. Amid national social reform, realism was not always enough for him. In fact, in surrealism, he found a means of expression and distortion he could merge with social reform; a method he used to enhance the emotional power of his paintings. Lenson used parables and proverbs from the Bible as the basis for his work, and 'while the parable is ancient, it was also turned into a contemporary comment on spirit.' Among his other accomplishments, he produced murals at the New Jersey Pavilion at the 1939 World’s Fair (now destroyed), the U.S. Post Office in Newark, and the New Jersey Federation of Women’s Clubs in New Brunswick. His line drawings were described by Art News as careful and executed with brilliant technique. Lenson’s works have been shown and owned by some of the region’s and country’s best-known museums, but to thousands he is best remembered as art critic for the Newark News. He died in June 1971, but his legacy will live on. Newark-born Henry Gasser lived from 1912 until 1984 and was one of the city’s best-known watercolorists. While the bulk of his work identified him as a good regional painter, he had a reputation throughout the nation as a visual chronicler. Gasser’s work began with his sketchings of the Passaic at Newark when he was a boy. Over the years, the river played a prominent role in his feelings about the city. He attended the Newark School of Fine and Industrial Art and majored in fine art and advertising design. He studied under Robert Brackman and William McNutley at the Art Students League in New York, and then took private lessons with John R. Braack. Unlike other artists, he began his career as a commercial artist and then spent more time as an easel artist later in life. He once said the only difference between fine and commercial art is that 'in commercial art you must see things through the eyes of others. In fine art you are free to show things as you see them, to reflect your personal feelings.' Gasser planned to be a commercial artist from the beginning, yet ended up a fine artist. From 1947 until 1965, he was director of the Newark School of Fine and Industrial Arts where he was also a teacher and writer. He later headed the Art Department of the Prudential Insurance Co. When asked which technique he used in his 1966 Newark Tercentenary sketches, he said, 'Oils are too heavy a medium for handling architectural details. I considered casein, but I have a tendency to work in too tight a manner in this medium, I eliminated it as a possible choice and finally I settled for watercolor combined with ink undertone.' For more than 40 years Gasser sketched and painted Newark’s streets, parks, homes and business districts. But most of all he liked to capture the somber mood of the Passaic River in all its unromantic facets, singling out industrial figures, capturing old houses grown shabby, and recording the backyard junkyards and forlorn cemeteries. A view of the city’s landmarks in the rain and snow was of special interest—in many instances a dreary lonely scene. In 1948 as a watercolorist Gasser won election as an associate in the National Academy of Design. Two years later he was elected to full academic status. He became a member of the Philadelphia Watercolor Club, the Connecticut Academy, the California Water Color Society, the Audubon Artists and Allied Artists of America and the Royal Society of Art. He also held life memberships in the Salmagundi Club, the National Arts Club and the Art Students League. At the peak of his career, he had been the recipient of more than 100 awards and prizes. His paintings were collected by more than 20 major institutions, including the Metropolitan, the Boston, Philadelphia, Newark and Montclair museums. He also wrote six books on painting. Once familiar with a Gasser painting, it is pretty easy to recognize another. In November 1966, the American Artist reproduced several examples of his work that depicted his distinct style of painting—buildings being demolished, the Newark skyline during an air raid blackout, a gargoyle on the old Prudential building and old brick tenements. In 1966 the Prudential commissioned six new paintings, including the Newark Skyline, Military Park, the Old Stone Schoolhouse, Branch Brook Park, City Hall and the Essex County Court House, a landmark portfolio of six historic sites. In 1940, during the early part of his career, the Newark News said of him, 'Newark has found the man to paint its portrait.' And paint he did until the end of his life. Master artist Henry Gasser recorded the city’s 'somber sense of beauty' for all to see, and for all times, and observed change happening here with the building of the freeways and the accompanying flight to greener pastures at the other end of the sunset, or perhaps just a stop in a nearby burb. Adolf Konrad was born in Bremen, Germany, in 1915, lived in Newark from 1935 until 1960, moved to Morristown, and is now a resident of Asbury, in the western part of the state. He is the youngest of our three artists to paint Newark and is still an active painter. Often, he is referred to as 'dean of Newark painters' and 'painter laureate of 20th century Newark.' In Bremen, Konrad lived near the sea. As a boy, he was impressed by street musicians, impressions that can be found in later life in his paintings. Konrad began painting at age eight and left Germany at 10. In 1929, he attended the Fawcett Art School and studied painting with Barnard Gussow at the Newark School of Fine and Industrial Art, where he became familiar with cubism and surrealism and the traditions of French art. He also studied with Giorgio de Chirico, and received a scholarship to attend the Cummington School in Massachusetts in 1936. A man of many talents, he had studied the cello and thought of becoming a musician. But painting won out. In 1937 he was elected a fellow with the Louis Comfort Tiffany Foundation and began working on the WPA’s Easel Project. A European trip brought him in contact with many masterpieces. He was particularly impressed by the Sistine Chapel. Once you have studied a Konrad painting you observe several things: you see parts or fragments of a decaying society recognizable to the old-time Newarker, and you see it from a variety of views. You might be looking at the steeple of St. Patrick’s Pro-Cathedral, the Seth Boyden statue in Washington Park, or the tower of North Reformed church, scattered around the edge of Washington Park and bathed in the golden light of a sunrise or sunset. You see the beauty of the architecture, the strength of a monument, and witness ghostly voices of the past calling to you all at the same time. Mellow golden and brown hues surround you, and you are engulfed in an enigmatic lushness of an Elgar symphony. One critic observed that Konrad played on a dualism of matter and spirit, and that each edifice is left with an aura of the man who stacked the bricks, the inhabitants, the visitors, as well as those who were born and died there. One magazine writer noted that Konrad’s works have the feeling of improvisation, or something happening or moving. To others, a Konrad canvas is the story of buildings, and not people. To them, the artist evokes memories of old store fronts, tavern signs, barber poles, costumed musicians, drawbridges, ghostly traces of trains, and retired elders peering out of darkened windows. Like Henry Gasser, Adolf Konrad’s work is found mainly in the hands of private collectors or in museums, both great and small, and their catalogs of them are ample. For anybody keenly interested in what Newark looked like between the 1940s and the 1980s, there is no richer or lovelier view of the city. Konrad’s important works include: 'The Red Bridge,' 1944; the Bridge Street Bridge, now painted blue; 'North Broad Street,' 1949, a canvas showing a musician, and a Seth Boyden railroad engine; 'End of Day,' 1952, the old now-demolished Titus house behind the Bell Atlantic building at Lombardy and Atlantic streets; 'Music on Fulton Street,' 1952, showing three-story red brick row houses with wooden bay windows; 'Facade,' 1958, with the old Broad Street Theatre; 'The Ballantine House,' 1980, a recently renovated portion of the Newark Museum, and the 'Old Books Shop,' a store window filled with 'small furniture, books, bricabrac, etc.' and the recurring theme of a musical instrument. A 1997 exhibition at Newark Museum also featured 'Left of Center,' 1942, featuring a desolate sign for a long-abandoned business, and 'The Blizzard of ‘48,' a view of rooftops from the artist’s studio looking toward Peddie Church, the Symington House and Military Park. Thanks to Lenson, Gasser and Konrad, the community has been recorded painstakingly for both old-timers and Newarkers yet to come.